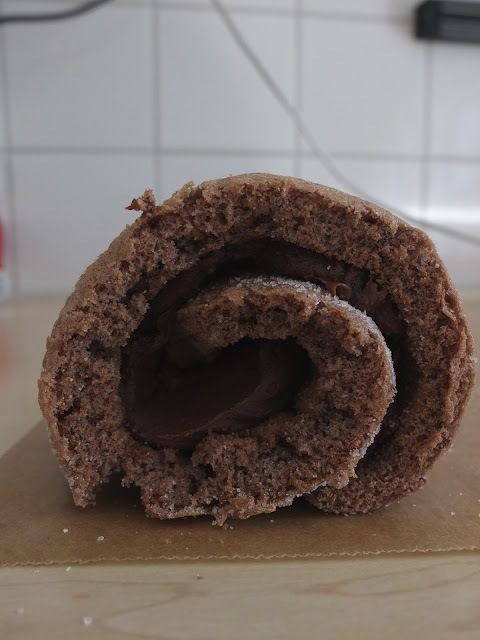 Initially I had planned to bake a single roulade, but it soon became clear that this would grotesquely distort the proportions - after all, the rocket, a VSB-30, about 12 meters long with a diameter of less than half a meter! The payload was painted in pretty white lettering with a golden 50. The next picture shows the respective first and second stage for TEXUS 50 and 51. Note the differently colored fins! 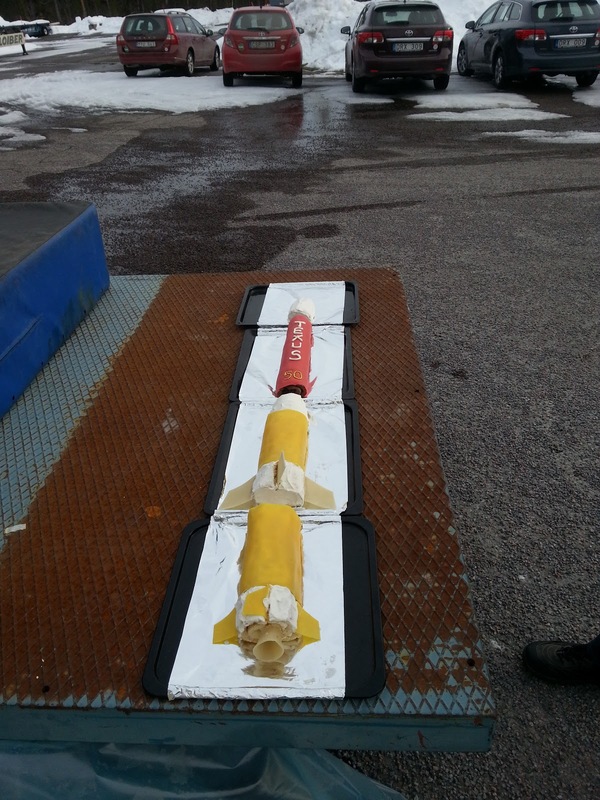 That's how it looks when the two stages are already in the launcher and the payload is lifted on top of them. 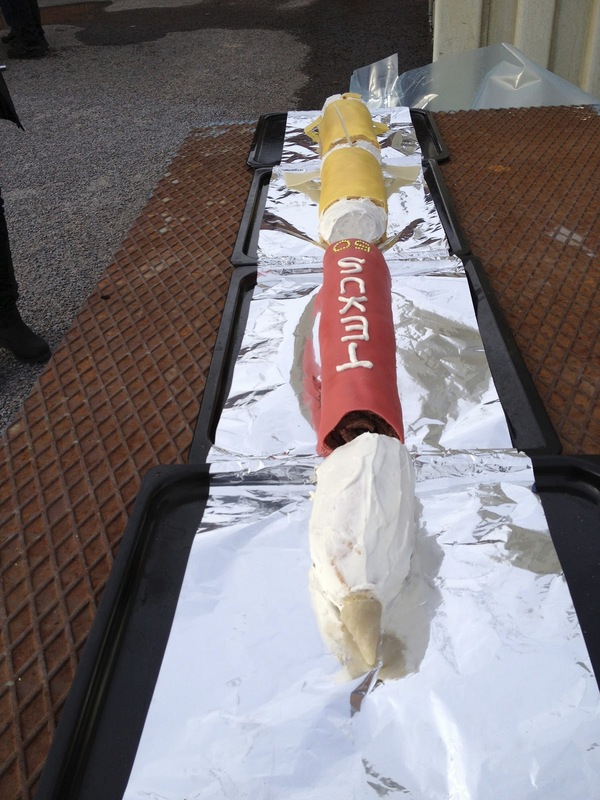 As with my cake, it is not easy to get the original rocket in one picture in full length! The fact that the payload (the red part) is thinner than the stages (the two orange parts with the fins), I solved, as I think, very practically by rolling up one roulade from the long side of the baking tray, resulting in a long, narrow roll, by rolling up two sponge roulades from the short side of the tray, which resulted in two shorter, thicker roulades. Just as with the real rocket, I needed an engine adapter which connects the two parts, which I made by rolling up a part of the fourth roulade diagonally. The other part of the fourth roulade, I rolled and cut diagonally to form the top. 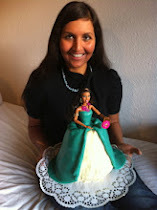 The fins, the nozzle and tip are molded from marzipan. 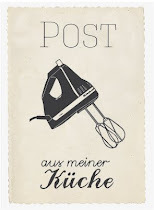 Zuerst die Finnen, Düse und Spitze aus Marzipan herstellen, damit diese über Nacht trocknen können. Bei diesen kleinen Teilen funktionierte die Weinflasche als Wellholz noch ganz gut, für die große Fläche später hat eine (verschlossene) Bierdose noch besser funktioniert. Die Finnen aus dünn ausgerollten Marzipan ausschneiden, einen dünnen Streifen als Finnschuhe um die untere Kante biegen, über Nacht trocknen lassen. Die Düse und die Spitze habe ich erst am nächsten Tag geformt, die wurden auch noch einigermaßen formstabil! First, make the fins, nozzle and tip from marzipan, so that they can dry overnight. With these small parts, the wine bottle worked quite well as an improvised rolling pin, but for the larger areas later I used a (closed) beer can, which worked even better. Cut the fins from thinly rolled marzipan, bend a thin strip as fin shoes around the bottom edge, let dry overnight. I formed the nozzle and the tip on the next day, and they were also reasonably stable! Prepare the nougat filling for the payload: Melt cream, chocolate and nougat on a low flame. Preheat oven to 200° C. Measure and mix flour and cornstarch (and for the payload roulade, once the cocoa). Measure and mix together eggs and sugar in a large bowl. Beat eggs and sugar until frothy white, gently fold in flour mixture. Pour the cake batter on a lined baking tray and smooth. Bake the sponge 8-10 minutes at 200° C.
Turn out the sponge on a tea towel sprinkled with 2 tablespoons sugar. Then use the tea towel to roll up the sponge, and let the roulade cool while rolled. Roll up the payload roll (the one with the cocoa) from the long side and roll up all the other 3 light sponges from the short side! When the sponge has cooled, dice the peaches for the filling of the roulades and whip the nougat cream. Carefully unroll the dark sponge roulade and spread with nougat payload. Roll up the roualde again, brush off the sugar a bit and set aside. Whip 500 g cream until stiff and fold in the peach pieces. Unroll two short sponge roulades for the stages carefully and spread each with half the peach cream. Roll up the roulades again, brush off the sugar and set aside. For the decoration, line 4 baking trays with aluminum foil. Beat 300 g whipping cream until stiff, roll out the yellow marzipan to form a large rectangle, about 40 x 40 cm, and cut in half so that there are two rectangles with dimensions "circumference the roulade" x " length of the roulade minus 6 cm". Place a filled sponge roulade on a baking sheet lined with aluminum foil and coat it thinly with whipped cream, place marzipan rectangle such that it is aligned on the front end. Coat the rear part with whipped cream and press fins press into the dough. Stick the nozzle into the sponge roulade at the rear end. If necessary, take the fins and the nozzle out again, as they are quickly softened by the cream! Similarly, decorate the second stage, only without nozzle and with the white fins. Leave room in front for the motor adapter! For the motor adapter, which is applied to the front of the second stage, cut about one-third of the fourth sponge roulade and roll it up at an angle, so that the smaller diameter matches the nougat roulade and the wider diameter corresponds to the peach roulade. Fill this truncated cone with whipped cream and cut straight. Set the motor adapter in front of the second stage and coat it with whipped cream. For the payload roulade, roll out the red marzipan into a rectangle about 44 x 15 cm, measure length and girth of the payload roulade before. Thinly coat he nougat role with whipped cream and wrap it with the red marzipan. Put some cream in a pastry bag or a sandwich bag and pipe the TEXUS logo. I made the 50 from ​​golden sugar beads - great fun, because they like to roll away, and then ALWAYS end up under the roulade! For the rocket nose, unroll part of the fourth roulade, fill it with whipped cream and roll it up as unevenly as possible. Trim the rear end and cut the front end to form a tip. Coat the nose with cream, glue on the marzipan tip in front and place on the fourth tray in front of the payload part. And that finishes the TEXUS 50 Roulade!